The Buffalo Teachers Federation is aggressively fighting a flawed evaluation system, over the system’s termination use of evaluations. On June 17 followed through with its threats, first made in April, to take legal action against the Buffalo Public Schools. The BTF filed a notice of claim against the BPS in State Supreme Court. As the Buffalo News’ Sandra Tan reports, the notice is the required preliminary step towards filing a full formal suit. Whereas on the other hand, the UFT leadership has endorsed the State Education Commissioner John King-imposed evaluation system which carry terminations. Michael Mulgrew, the latter union’s president casts this value-added modeling plan plus Danielson Framework evaluation structure –plus a termination tie-in– as a win for teachers. (The latter union’s givebacks in the last three years amount to a de facto contract.) The BTF’s struggle over evaluations is a fight deserving support, and their stance on evaluations is one to be emulated. At the heart of the Buffalo Teacher Federation’s fight are evaluations and the punitive use of them, toward 3020a terminations of teachers. The union did not trust the application of the evaluations. It secured a memorandum of understanding (MOU) with the Buffalo School District, pledging that they would not be used in a punitive manner to render negative evaluations. The New York State Education Department, Commissioner King, and Governor Andrew Cuomo are claiming that the agreement is illegal. The BTF is standing by their guns. State officials claim that the agreement was not submitted for approval as part of the districts’ official teacher-evaluation procedure, according to the Buffalo News’ Tan. The BTF Executive Committee unanimously approved the resolution to take legal action against the district by June 1 and file additional grievances for “non-adherence” to a pact the district made with the union in January. The agreement stated that the district would not use two years of teacher evaluations as grounds for termination. 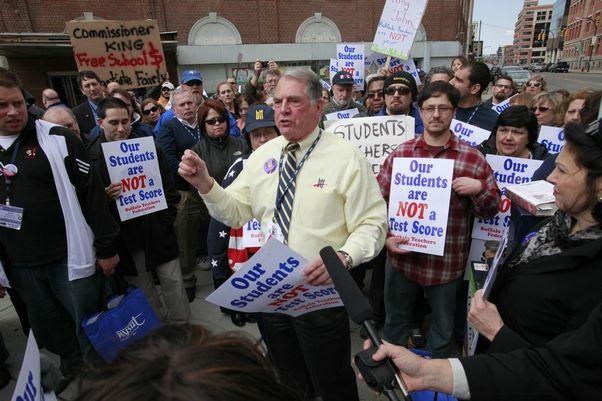 “We will leave no stone unturned to make sure these evaluations, which everybody now realizes were flawed, aren’t being held against our teachers,” said BTF President Philip Rumore. Legal action by the teachers union could threaten the status of more than $30 million in state aid this year, in addition to more than $10 million in various other government funding this year and tens of millions in future years. Rumore said the BTF will work with the New York State United Teachers union to legally challenge any effort by the state to withhold funds from the Buffalo Public Schools. “We’re going to fight to make sure that they don’t use our kids as pawns in order for us to get this money,” he said. Finally, the BTF may still consider rescinding, by vote of all Buffalo teachers, its approval of the teacher evaluations for the last two school years. The press and the state have drawn attention to the loss of millions of dollars of aid. Much of this drawing from Race to the Top monies. Critics have pointed to how the costs of implementing Race to the Top exceed the amount of money the RTTT grants provide. This raises the question of whether participating in all the program that generates the new Annual Professional Performance Review evaluation requirements and other stipulations are actually cost-effective. South Orangetown District Superintendent Ken Mitchell wrote that the Common Core training for 18 lower Hudson Valley districts would amount to an estimated $4,094,820. Yet, the RTTT grants would only extend $520,415 to the districts. CARROT AND STICK or SHADES OF DANIELSON THINGS TO COME? The use of the evaluations plan has already confirmed Buffalo teachers’ suspicions, with virtually blanket ineffective ratings in certain schools. In 2011-12, Buffalo was one of a handful of districts across the state receiving federal school-improvement grants. To qualify for the money, the district had to have a state-approved teacher-evaluation plan in place at the six schools receiving the grants: Martin Luther King Jr. Multicultural Institute; International School 45; and Bennett, Riverside, South Park and Burgard high schools. Much of the resolution highlights what the union considers to be significant flaws in the teacher-evaluation formula. In other cases, where two teachers worked with the same set of students, one received 20 evaluation points, while the other teacher received zero. “Buffalo teachers and teachers across New York State would not have entered into agreements utilizing untested, untried evaluation systems without assurances that due to its untested procedures, it would not be used against them,” the BTF executive committee statement said. For months now, off the major media grid, people have written and talked about a seven percent quota of teachers that Mulgrew has agreed will be lined up for unsatisfactory “U” ratings in end of year evaluations by the New York City Department of Education, setting them in line for 3020a hearings to be stripped of their state teaching license. The UFT has said nothing to confirm or deny the allegations of the seven percent quota. The UFT already has conceded the very point that the BTF contests. Hundreds of municipalities –not merely Buffalo– across the state have side agreements to their evaluation schemes, including stipulations that the evaluations will not be used punitively, that is, in line for teachers to lose their licenses. Returning to Buffalo’s evaluation agreement, the memorandum of Understanding (MOU; see here, here and here) between the Buffalo school district and the Buffalo Teachers Federation stands in stark contrast to what Mulgrew has conceded to for the UFT. The original BPS-BTF agreement guarantees against its punitive use for termination, it factors in student student absenteeism, by degrees of absenteeism. This spring, the blogger at B-Lo Ed Scene, wrote on Governor Cuomo’s going ballistic over Buffalo’s MOU here and here. It was likely in the context of this dispute that Commissioner King this summer asked the state legislature for powers to takeover “failing school districts,” citing Buffalo as one such district. If he would have state authority over Buffalo, we can doubt that he would allow the anti-termination use MOU deal that the BPS and the BTF struck. In late August, King has ratcheted up his moves against plans, claiming that schools are not turning around as fast as he wishes. This would be the first big city takeover of a school system in New York State. As the New York Times has written, these takeovers have had mixed results. It cited New York’s takeover of the Roosevelt school system as an unproductive takeover. In Los Angeles the school district sought to impose a value-added measure plan, through compliance with Race to the Top. In a move similar to the BTF, the teachers’ union, the United Teachers of Los Angeles (UTLA), rejected participation in the plan because of its goals of subjecting them to VAM assessments. As is apparent from reportage going back over a year, the BTF has had friction over this issue for a while. This notice of claim is the culmination. As just noted, Los Angeles teachers balked at Race to the Top participation over the value-added assessments. On the other hand, the Mulgrew’s leadership, has always went along, not grudgingly, but enthusiastically, along with New York State’s Race to the Top application, along with the Danielson Frameworks, along with value-added modeling based on student high-stakes test scores. Never in Mulgrew’s statements about Bloomberg or the city did you ever hear Mulgrew make a principled statement against VAM, test-based evaluations. It is a big mistake when people swoon over his sneers against NYC mayor Bloomberg. Judge Mulgrew by his actions, collaborating with the reformers on the key points. The public is also having doubts about judging teachers by high-stakes tests. A PDK-Gallup poll reported that nearly 60 percent of the people it surveyed opposed using student test scores to evaluate teachers. This article is by Geo Karo and does not necessarily represent the views of MORE. So how did they come up with the magic seven percent figure? How do the powers that be know in advance how the evaluations will pan out? I think this should be distributed to the next DA. Why can’t we take a vote of no confidence against Mulgrew?? In addition we should vote down any contract that supports this idiotic teacher evaluation as part of the contract language. I am tired of having no support on local, state and federal levels!! !